‘Agile’ is buzz word that has recently taken hold in the marketing community. I hear it all the time now, but it’s not a new concept. In fact, it has a well-established presence in the project management and IT development community. Note that when referring to marketing I say agile is a ‘buzz word‘ not a concept. Why? Because most marketers don’t know what it really means. ‘Agile’ is usually (mis)used when marketers are attempting to clear their path of obstacles to their favorite type of rapid-fire pasta method marketing – keep grabbing handfuls of hot stuff out of the pot and throwing it against the wall until something sticks. Ok, that might be a cynical over-generalization. I know that’s not what you ALL mean. But most marketers typically do make a plea for ‘agile’ when they’re feeling oppressed by things like strategy, planning, quality assurance and measurement. 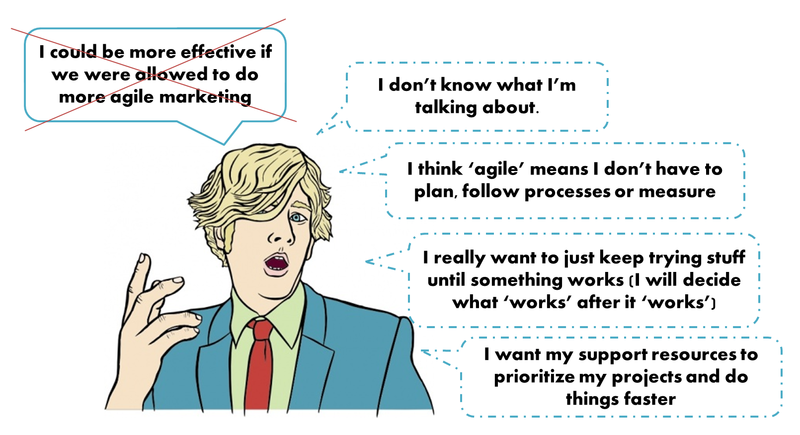 These four things are most marketers least-favorite thing to do and they’re globbing on to the concept of ‘agile marketing’ because they think it means getting things done faster…and it does…but it it actually means more focus on processes…a LOT more. So if this is what you mean when you say ‘we need to do more agile marketing‘ you sound stupid. Agile marketing is a formalized concept that refers to a method of project management characterized by the division of tasks into short phases of work and frequent reassessment and adaptation of plans. It requires rigorous discipline and commitment to processes that repeat themselves over and over again every 2-4 weeks. It’s ‘agile’ because you’re only committed to what you planned for the length of that planning cycle (aka ‘sprint’), after which you can change and iterate if needed for the next sprint after you measured the result of the last and objectively determined what should and should not be repeated/continued. Let’s say this is what you mean when you say you want to do agile marketing. Great. But before you start, you’re going to need to make sure you’re set up to support this shift is process…and it is a significant shift. This isn’t just something you start doing, especially if you’e a large organization. Remember, the concept here is moving faster and more easily toward your goal, which means you need to first define what you want to accomplish and who needs to be involved to get it done. Sounds simple enough, but this can be hard in large organizations where there are lot of marketers trying to accomplish different things. Meaning this: If agile group 1 is running isolated iterative campaigns inclusive of customer personas A, B, C & D. And agile group 2 is running isolated iterative campaigns inclusive of customer personas C, D, E & F, customers C & D are very likely getting barraided and confused by unrelated disjointed marketing messages. Thats a #marketingfail. Whomp Whomp. Due to the nature of agile marketing, groups will become engrossed in their own sprint cycles and it can become challenging for people to pop their heads up our of their meerkat holes to ensure there’s still a unification across the groups. As you can image, it could become very easy for each group to develop their own sense of brand identity thats self serving to their goal but over time may diverge from the ‘big picture.’ It’s important, therefore, to establish and regularly reinforce what that big picture is. In marketing land this means ‘what are we trying to achieve as a whole in order to support company objectives?’ and ‘who are we (as a brand)?’ Some companies struggle with their brand identity and the result is that they do not present a clear or consistent picture of themselves to the market. This is a common struggle even in non-agile marketing environments. It’s even harder in agile ones. Don’t let that happen. Again, this is not a lesson in how to do agile marketing so I wont get too deeply into this. Just think of your ‘scrum’ master as the head project manager responsible for running daily meetings and collecting feedback from each project participant to find out what they did yesterday, what they’re doing today, and what obstacles may be in their way. This job is repetitive and tedious and requires someone adept at keeping people focused and their inputs concise and limited only to the tasks at hand. Most marketers who are throwing out the ‘agile’ buzz word are not going to make this process methodology shift. It’s not for everyone. Candidly, it’s not for me. I do understand the desire to be faster and more responsive to the market. This is important, but you cannot forsake strategy, planning, process, and measurement for speed. Find your balance. A phenomenon of our culture is the miracle cure that is the band-aid (the universal recognition of the Band-Aid brand itself is a quite impressive phenomenon, but that’s off-point). You know what I’m talking about, right? It doesn’t matter if the malady is a scratch, a bruise, or a bump on the head, a band-aid will probably cure it…if you’re under the age of 10. Then we get smart and grow out of that delusion…right? I don’t think the need for a psychological quick fix ever leaves us, it just manifests itself in other ways. We’re all guilty from time to time of looking for a quick fix to a problem that’s either to complicated or too time consuming to really resolve the right way. I’ve done it. You’ve done it. We’ve all done it. We’re human. Sometimes being human can lead you to make dumb decisions. Sometimes to be a good marketer you need to be better than just human. Scenario: You are a marketer (naturally). You are running a series of web ads promoting a new product. After a week you’re only at 30% of your expected conversion rate. What do you do? If you picked 1: I’m disappointed in you but not surprised. You need to learn to balance decisiveness and patience, grasshopper. Many people don’t do this because they simply don’t have the time. It’s faster to just make a switch and see if it works. I get it. We’re all busy, but taking the time to do it right will usually return better results than doing it quickly. If you picked 2: You get a gold star (or a cookie…I’d prefer a cookie). Take the time to diagnose the problem, let the data tell the story and guide your decision, approach the solution strategically, and then you set yourself up to be agile and adjust for success. I f you picked 4: You’re worse than the 3-selectors. They’re obviously nuts, but you’re just sane enough that in the minds of many (who don’t think about it too hard) this is a reasonable option. I’d call this putting a band-aid on a nosebleed. Most people will realize it’s not quite right but if you put it on tight enough it will stop the blood from pouring out…at least for a little bit. My point: if you believe that what you’re doing matters, do the right thing, not the fast thing. Don’t have time? Do fewer things better than a lot of things half-assed. And if what you’re doing doesn’t matter enough to do it right, then don’t do it at all (and I suggest rethinking what the hell you’re doing).